Putting Your Coins In A Good Place? 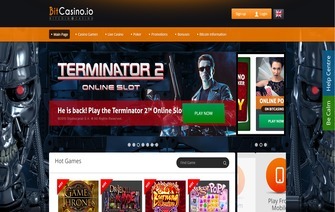 Bitcasino.io, first launched in early January 2014, is an online casino that seeks to provide players an opportunity to play quite the popular online casino games that players like to play. They also provide a unique poker room that may be a little different than what most players are used to. With a great support staff and more players joining the gaming community each day, Bitcasino.io continues to grow in the Bitcoin industry by providing over 280 selections of games, and adding more, on a consistent basis. The games offered at Bitcasino.io are right in line with some of the it’s top competitors in the industry. With over 280 selections that they provide, they display a great portfolio when it comes time for a player to be able to choose a specific game and style of their liking. Most games are available for free play. The most impressive part of their game selection, is the amount of slots that they have featured at Bitcasino.io. As far as slots go, Bitcasino.io undoubtedly provides one of the largest selections of different slots, in the Bitcoin gaming industry. Not only do they provide a great selection of slots, but also some of the biggest jackpots, within the slots, that players have an opportunity to win. At the time of this writing, the game “Tycoons Plus” had over a 96 BTC jackpot, which is one of the highest jackpots players could say they have seen at any Bitcoin casino, with today’s Bitcoin poularity. If a player is not big into slots, Bitcasino.io also provides many table games for a player to enjoy. With roulette, blackjack, craps, three card poker, and some different variations for each, Bitcoincasino.io is a casino that any player could find something to play. We here at BitcoinCasinoPro were very impressed by the casino game selection. As far as Bitcoincasino.io’s poker room goes, it will undoubtedly be a little strange for regular poker players to get used to, when they play in their poker room. If a player joins a multi-table tournament, the player is seated with four other players at a five seat table, instead of the usual 10 seat table that most poker rooms are set up with. What gets even stranger is that when a player folds his hand, the player immediately leaves the table, to either start or join a new table of other players who have folded or have finished their hand. (If this sounds confusing, it’s because it is). Basically, in a simple explanation, once a player decides that his hand is no longer playable, and decides to fold, that player should be expecting a new hand, in mere seconds. They won’t be able to watch the hand finish, leaving the aspect of trying to learn players tendencies a mystery until the final table of five. This type of poker game is characterized as “fast fold poker” and was first introduced in 2010 by FullTilt under the trademark RushPoker. Another negative (if you call fast fold poker a negative of course!) about Bitcasino.io’s poker platform is how the blinds work. A player can fold four straight times, and continue to receive the big blind every single time of those four times. A pattern couldn’t really be determined when we were testing the platform out but I now understand that it selects the person who hasn’t paid blinds in the longest time. I assumed that it was ultimately determined by a coin toss when it came to how the dealer button moved but apparently not! Next, a player can register for a tournament at any time, which makes the amount of “no-shows” increase, therefore delaying the amount of time and causing a rather boring experience. Last but not least, when there isn’t a free tournament going on, there is hardly a player to be seen within the poker room. While we assume that the way poker is currently played at Bitcasino.io was to alleviate a lot of players frustrations with time in between each hand, it ultimately was too much of a change for avid poker players. Sadly, that is painfully apparent by the lack of players that play there. Having a live dealer section of the casino in today’s market is almost deemed a necessity to have a great deal of credibility added. Bitcasino.io does have a 24/7 live dealer casino section that offers blackjack, roulette, keno, and baccarat. What is unique about Bitcoincasino.io, is that they also have a “live games”section that features video feeds of off-key style wagering games. Betting on the roll of five dice, betting on five different hands of poker, and betting on a wheel of 20 selections, they provide many different choices within a specific game. For example, in the dice game, you can bet on the odds being 1:1 (such as even or odd total result) or high-odds style wagering (all 5 dice the same number) at a whopping 500:1. These options are available for about 16 hours a day and have a convenient time clock displayed, in order for a player to see how much time they have, before the game is officially going to start. While it may not be what most players are usually wagering Bitcoin on, it is another unique option for a player to experience. Banking on Bitcoincasino.io is an overall smooth and great experience. Deposits are usually quite instant after they’ve hit the blockchain, and the withdrawals are usually quite instant, as well, pending all of a player’s deposits have gone through the required confirmations. After requesting a withdrawal, it took about 30 seconds in order for it to appear on the blockchain, which is a very important advantage in today’s industry. Bitcasino.io offers three different deposit bonuses . They offer a 100% match for the first deposit, a 50% match for the second deposit, and a 25% match for each subsequent deposit, for life, when a player mentions the bonus to a live chat representative. The only caveat to these bonuses is that in order to withdraw, the player has to wager at least 35x whatever the bonus is, to be able to withdraw it. Certain games such as slots contribute to this number 1:1 (so if a player receives 100mBTC as a bonus, they would have to accumulate wagers up to 3,500mBTC, in order for it to be released). Other games such as blackjack are only counted as 10% of the wagering requirement (so if that same player just played blackjack, they would have to accumulate wagers totaling 35,000mBTC, in order for the bonus to be released). So while these bonuses do look great on the outside, due to the large amount of wagering that is required of them, players should proceed with caution when requesting a deposit bonus. Bitcasino.io also claims to have a “VIP program” that can be offered to players. How does a player become a VIP? “Just keep playing, and a VIP manager will contact you”, is what is listed in the information section. As far as perks of this very vague and mysterious VIP program, they don’t seem to go along with commending a “VIP” status. A 10mBTC free credit, free random gifts, and 50% reload bonuses aren’t exactly what we would consider true VIP’s deserving of. So as far as bonus offers go, Bitcasino.io has them, but the average player would probably find them more insulting, than rewarding. Customer support at Bitcoincasino.io is quite the good experience, when ever needed. They provide a live chat service that is available throughout most hours of the day, and if they happen to be off-line, they do return email within a 2 to 3 hour time frame. As the months have increased since Bitcasino.io has been online, they’ve continued to grow their support staff and expect to have live 24/7 support, within the next few months. As far as the queries we sent them, they provided tremendous help and were very professional when it came to handling any and all matters. When it comes to game fairness, Bitcasino.io uses industry-leading software providers that make games around the Random Number Generation technology. Regarding game providers, at the moment they have Betsoft (for slots – with around 450 BTC in jackpots), Ezugi (for live dealers), and Betgames (for dice and lottery games). Bitcasino.io has a large variety of different casino games and a lot of big jackpots, when it comes to certain slot style games. They also have an adequate amount of table style games for the players who don’t necessarily play slots. Although they have a poker room, it really provides no value to the site, as it’s poor design and terrible gameplay need some major renovations. They do give players an opportunity to play in a live setting like some top casinos, and as a bonus, they provide live games that you won’t find many other places, with some pretty extensive betting combinations. Players who don’t want to worry about game fairness and lack of support, should definitely feel good about playing here. Anybody wanting to be rewarded for playing, should not. With all that being said, Bitcasino.io provides a great place for avid slot players who love big jackpots, and casual table game players. As for poker players and bonus hunters, we recommend you try somewhere else. One thing that can’t be understated though, is the tremendous support and trustworthy banking that Bitcasino.io offers on a day to day basis. Bonus Your first deposit will be awarded a 100% bonus. So you can easily double your deposit. For example make a deposit of 400 mBTC and we will give you 400 mBTC more absolutely for free.